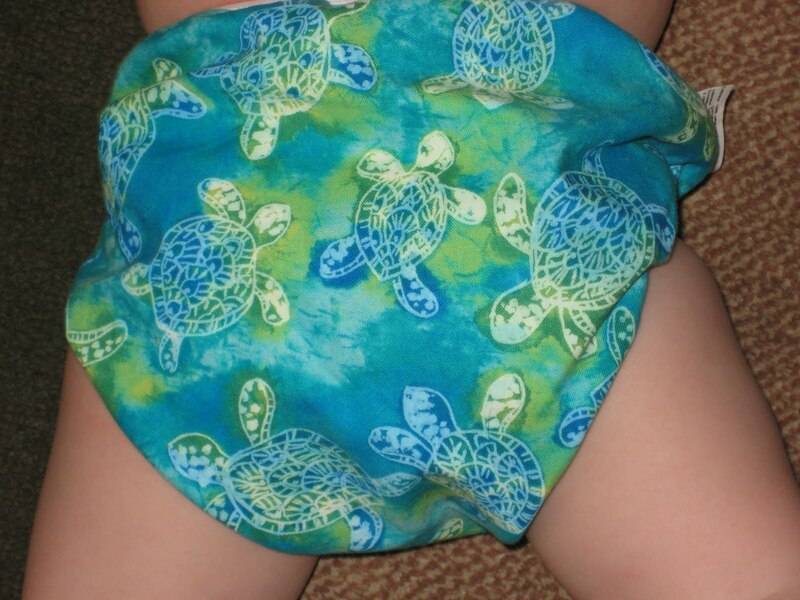 I actually bought this Bummis Swimmi swim diaper over the winter, when I thought we were going to do swim lessons at the YMCA (we didn’t.) Notice the strange color of the first few photos, that’s because there was snow on the ground reflecting light into the windows! The small fits 9-15 pounds, medium 15-22 pounds and large 22-30 pounds. I got the turtle print, since it’s all I could find in a medium. It is cute though! Like other disposable and reusable swim diapers, the Bummis Swimmi is not absorbent, and is simply designed to catch solid waste. 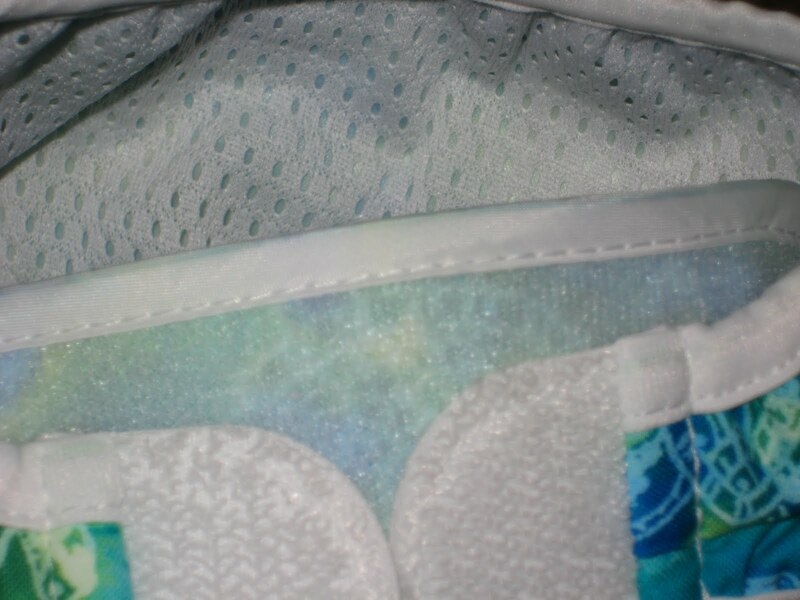 It has a polyester mesh lining, sandwiched nylon and a printed cotton outer. It has very easy to use hook and loop closures. This is my little guy at about 17 pounds and 28″ wearing a medium. There’s not much to say about it! It’s cute, fits well, easy to use and should do the “job” fine! I would use it under a swimsuit if your baby can open velcro! Want your own? Win it. I’m buying a Bummis Swimmi for one lucky blog reader. 1. Just leave me a comment on this blog post to get an entry. 2. Follow my blog publicly, comment saying you follow to get an entry. 3. Fan (Whatever! Old dog/new tricks and all) me on Facebook, comment saying so to get an entry. 4. Follow me on Twitter, comment saying so to get your entry. Just don’t “follow” me in a creepy way, heh. 6. Blog about this giveaway and link back to me. I’ll accept entries until Friday, June 11th, 2010 at 9:00, P.M. EST. I will choose a winner with random.org’s true random number generator and email the winner. This giveaway is open to residents of the U.S. only. Please be sure to leave your email address in your comment if it isn’t visible in your profile. If you win and I can’t contact you, I will choose another winner. The winner will choose her size, print and an alternate print from in stock prints. I will purchase the swim diaper for the winner and have it shipped directly to her. I reserve the right to make substitutions if necessary. Please note that this review and giveaway is neither affiliated with nor sponsored, endorsed or approved by Bummis or Abby’s Lane LLC. >I hope I win, my little girl would get lots of use out of the swim diaper. >Great idea. I'd save so much not buying swimmers. Pick me! >I liked your page on facebook!!! >This would be great this summer, since i really hate spending the money on disposable swimmies! And i cant find these anywhere in local stores! >That bummis swim diaper is so cute! >We've just been using an old cover. This would be awesome! >following with google friend connect! >just liked you on facebook as well! >ooh it's cute! I'd love to win! >I've always wanted to try a swim diaper. It's so awesome of you to offer this! >The local place we are going to take swim lessons at requires reusable swim diapers so these are great. >I would love to win this swimmi! >Too cute! I would love to win one for one of my kids. >I am a fan on Facebook. >These swimmies are really cue. >That is one adorable swim diaper! >I was definitely hoping to get a swim dipe for my son for the summer!andrewandkelly(at)live(dot)com. >TOO CUTE!! We are going swimming daily here. Great Giveaway! >We swim every day so I'd love one of these! >Oooh, in the market for a swim diaper! Ready for summer! >I've wanted to try out their swimmis. They look great! >I love my Swimmi too. It's getting too small though so a new one would be great! >My son just went swimming for the first time this week and I would love to try a non-disposable swim diaper. >I want a swimmi sooooooo bad! >I'm a follower of your blog. >That turtle print is cute! >I've been looking to buy a swim diaper for my little boy's first summer in the water! >I would love to try this swim diaper! >I'm a FB fan of yours. >I've been wanting to try one of these! thanks fpr the chance! >I'm a fan of yours on FB! >I need a new swim diaper for my daughter! >That is a SUPER cute turtle print! I'm lazy and just pull an insert out of one of my pocket dipes and use that as a "swim diaper". Works great for me. Thanks for the awesome giveaway! >I'm a fan on Facebook! >Great giveaway, these are so CUTE! >Fun! Just wanted to drop in and say hi, I won't put any more entries in since we already have one swim dipe, but enjoying your blog!